3 | Visualizer: Orange GraphicsThis small breakfast nook also takes advantage of the elegance of the Eames chair with four matching white examples set next to an adorable windowsill herb planters. 20 | Visualizer: Matt WilsonMore clear resin, but this time int he form of chairs, bringing a little levity to their heavy wooden table counterpart. 6 | Visualizer: Arthur Carvalho VieiraBy matching the chairs and table to the wood floor, the furniture seems almost to disappear, making the space seem larger and more open. 7 | Designer: PartiDesignAdding bench seating to one side of a dining table is always a good way to make a table more welcoming and help guests get to know one another. 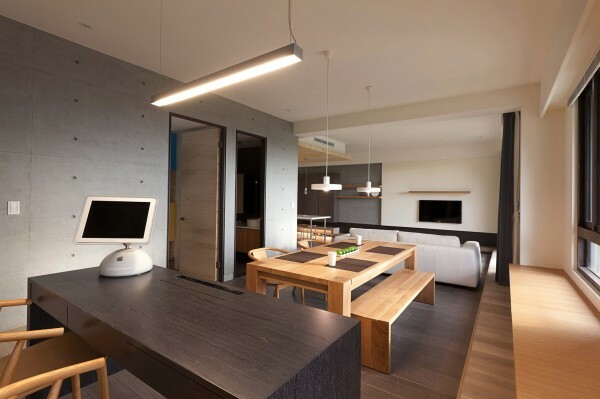 17 | Visualizer: Vic NguyenYou can’t help but notice the clear resin dining table that is the focal point of this room. 9 | Visualizer: Studio ArchDesignThis blue and white dining room would give off a feeling of a calming beach retreat no matter where it was. 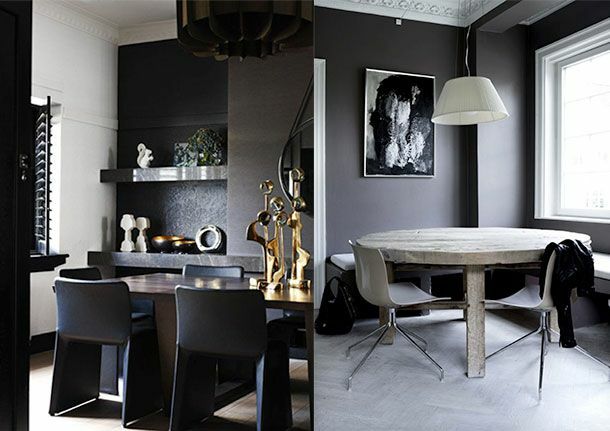 12 | Visualizer: Hesham ElshipliUsher guests into this stark dining room and they’ll surely be impressed with its molded chairs, stone accent wall and sleek black buffet. 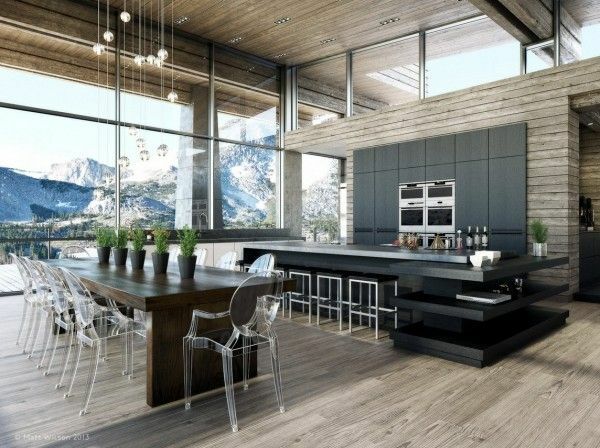 1 | Visualizer: Koj DesignsThis warm and welcoming dining room features plenty of light and seating that is modern but does not sacrifice comfort for style. 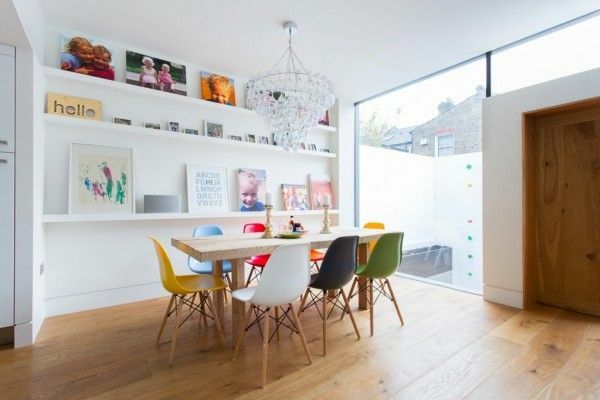 4 | Photographer: Olimpia Castellini BaldisseraIn this playful dining room, the designer has chosen a rainbow of Eames chairs which work nicely against the warm wooden floor and white walls. This would be a perfect space to play host to a special sleepover dinner party. 21 | Visualizer: Ngurah AryaThis built in dining area is a perfect solution for a small space but still manages to be stylish. When you invite people to your home to share a meal, you want to make sure they are comfortable, but it also doesn’t hurt if they are a little impressed. 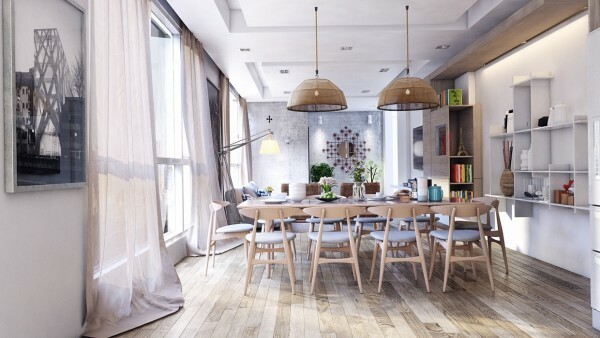 Any of these 21 dining room designs, from the cozy and rustic to the ultramodern, are sure to reflect well on the host. 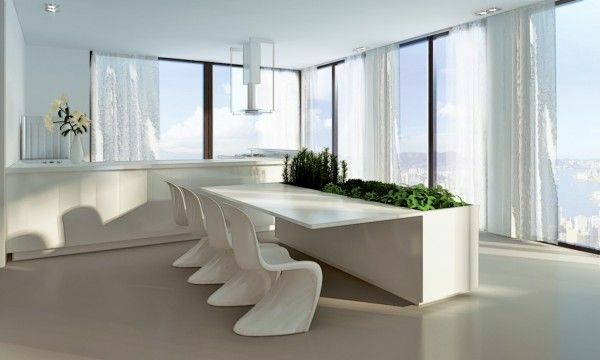 11 | Visualizer: ObrazekUltra minimal is the only way to describe this white dining table and matching Eames chairs. Even the floral centerpiece is a spindly branch rather than a busy bouquet. 16 | Visualizer: Enrico CericaThe metal chairs and hammered metal table give this dining room a distinctly warm industrial feel. 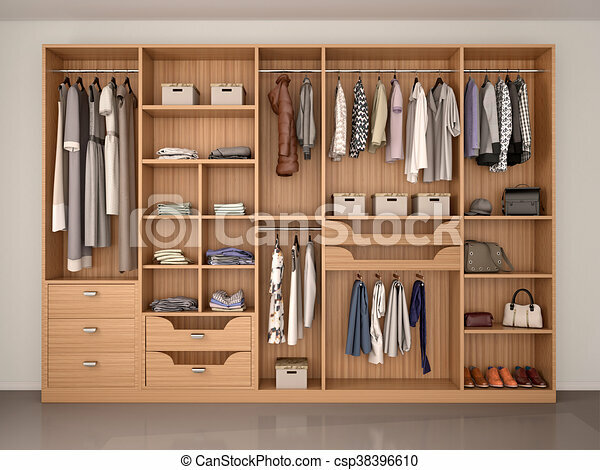 19 | Visualizer: Architype 3DAn update on the chrome fad of the 1980’s, this is a bachelor pad grown up. 14 | Visualizer: Orange GraphicsThis dining room is more like a great hall. 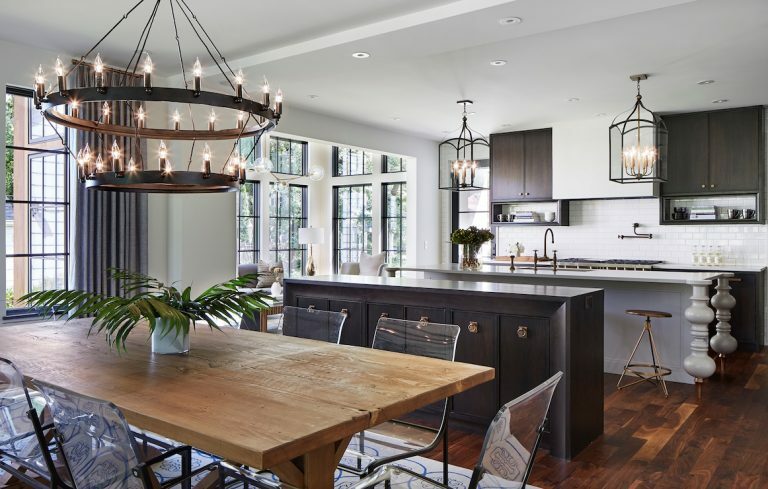 The geometric chairs contrast expertly with the solid wood table and rustic ceiling beams. 18 | Visualizer: Architype 3DThis dining room with its blue glass light fixtures and winding staircase backdrop would be suited to a tea party with Alice and her Mad Hatter friend. 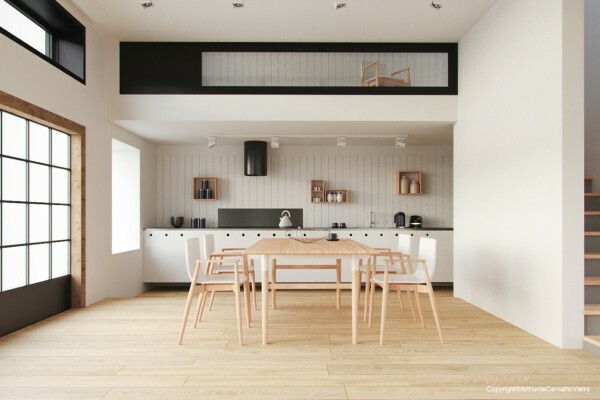 15 | Visualizer: ArchivizerEven without the space of a huge loft or massive house, this small apartment dining area manages to be chic and comfortable. 13 | Visualizer: Kleiton OliveiraArtists like to entertain, too. This urban dining room meshes with the industrial design of the space, using creative chairs and even more unique barstools. 10 | Visualizer: Ngọc BáuCreative lighting makes this dining room walk the line between a sophisticated night in a wild turn at a night club. 8 | Visualizer: Cecilia CordaThis amazing convertible dining table pulls back to reveal a small indoor garden, perfect for growing fresh herbs. On its own, the table is also a beautifully simple piece. 5 | Photographer: Olimpia Castellini BaldisseraBy throwing open the doors to the backyard, this simple white dining room becomes instantly inviting and easy to imagine covered with the trappings of a sunset cocktail party. 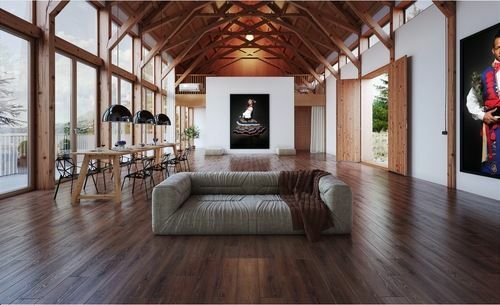 2 | Visualizer: MiysisThis open dining room takes advantage of high ceilings and an airy floor plan in its design. The simple and delicate molded chairs contact the formidable wooden table, which leaves plenty of room for even the most elaborate meal. The cool looking dining lights are the Beat pendants by Tom Dixon.